what color/brand grout did you use? Can anyone tell me what type of flooring is in the kitchen? We have dark espresso hardwood floors and want to know if we should go with a grey glass tile, or a brown glass tile. Thank you. Tile work - So, I'm doing the exact same tile and I was wondering how yours was done. It looks like there is no grout, which I prefer. Can you advise me on how this was done. Thank you! Glass Tiles are perfect for showers. With the range of colors available today they fit into interior design style you are going for. Glass is impervious to water so again, perfect for wet areas. Glass has had an extraordinary price journey over the last decade from a price of $50.00 a square foot down today's high volume producers like ourselves selling direct for just $7.45 a square foot. What is this granite called? 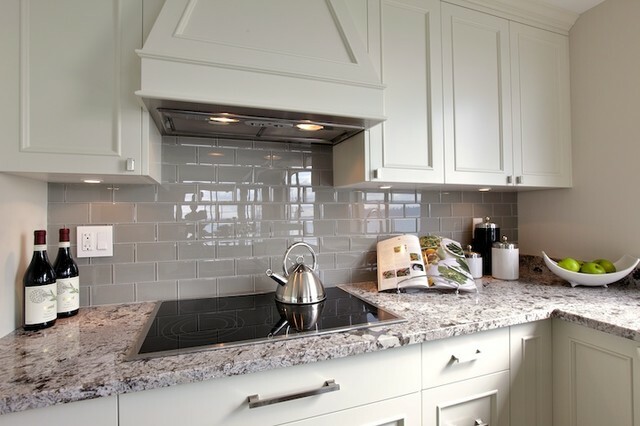 What are the specifics of the backsplash (color and brand, etc.)? Hi! - Can you tell me where you bought the hardware on the cabinets? The Hardware is from Restoration Hardware. It was the 'Strand' pull. Paint colour on the wall - Hi, can you tell me the paint colour on the wall? I am looking for grey glass tile for our backsplash and came across this kitchen with the grey glass tile. Somewhere I think I saw that you purchased it at Ames tile. I am wanting to order the same from Ames in Edmonton. Could you please share the name and colour, as they have a few different ones. Your help would be much appreciated! Thanks so much. 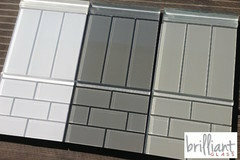 Brilliant Glass 3x6” Subway Tile Ocean Gray $7.45 a square foot: http://www.thebuilderdepot.com/glass8mmgray.html. 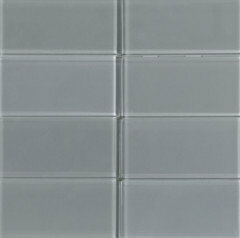 Glass tiles such a classic product stylish without a doubt but then super handy being practical and easy to keep clean. Glass has had an extraordinary price journey over the last decade from a price of $50.00 a square foot down today's high volume producers like ourselves selling direct for just $7.45 a square foot. Our collection of 3x6” Glass Subway Tiles are part of our Brilliant Glass Subway tile collection a premium 8mm tile warehoused in the USA order ship within 24-48 hours. Samples can ship same day. What paint color are the cabinets? Thanks!! The colour was Benjamin Moore - Winds Breath OC-24. It reads a little lighter in this image. Love this u-shaped layout... curious to know, where is the dishwasher? - We have a small kitchen and are having trouble placing the appliances, but this is perfect! Just wondering where the dishwasher is. Please tell me what color/type of grout was used with this tile? Nice granite selection for a white and black kitchen. Hood and countertops are nice in this pictures. I open to patterns in the countertops.